After almost a decade of owning it, I finally cleaned a painting today. I haven’t done that in a while, but once you learn the technique, you’ve got it. The painting needed cleaning the whole time but I was afraid. Sometimes you buy a painting, liking the muted hues you see, only to clean it and find it garish, or not just right anymore. I wish I’d taken a “before” picture. This painting has a lot of pinks in the sky and I was concerned that, cleaned, they’d overtake the canvas. I needn’t have worried. Even ninety years ago, the artist had more sense than that. If you read The Emma Caites Way, you’ll see that art restoration is actually a part of my background. It’s an interesting way to learn more about art. I’m taken with the plein air paintings of the Arts & Crafts period. I like how the artist, on the fly, can suggest light and space with a few deft strokes, or even just a well-informed line or a perfectly placed splash of color. Generally cleaning a painting brightens it and more clearly reveals the artist’s original intent. It removes accumulated oils, dirt and smoke residue, helping to protect the canvas over the long haul. In the process you become almost intimate with the work. You have to work within the artist’s original brush strokes, gently wiping clean the grooves left by the bristles in his brush. If you work the surface too hard—or scrub—you can damage the original paint. The work is painstaking. When you’re satisfied that you’ve done as much as you can (or as much as the canvas will endure) you protect it with a thin layer of conservation varnish. By the time you finish, you really know the painting. 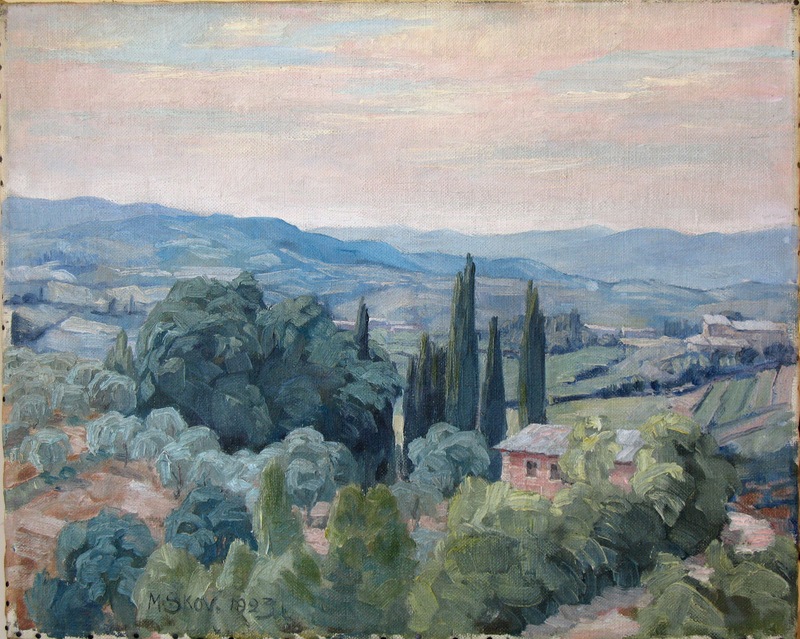 This Danish painting is from 1923, apparently painted in Tuscany—I don’t think there are olive trees in Denmark. The artist, Marius Skov, is a “listed” Danish artist, meaning that he was recognized in his time. The cleaning lifted nearly a century of grime and funk from his canvas. It’s brighter and clearer than I would have guessed. Indeed there’s a roadway (or maybe a river) in the foreground that I never saw before. It’s a surprise. With a good cleaning, you expect to see more features in the bright areas. What surprises me is how much new detail is revealed in the shadows. The trees in the center, once just a blob of dark green, now reveal new colors and brushstrokes that weren’t visible before. And now the countryside is dotted with neighboring villas and farm buildings, previously lost in the haze. Even the distant hills undulate in new distinct shades of blue and purple. Once, years ago, I cleaned a painting of a waterfall and pond, and found that it’d been partially painted over–a figure, a man fly-fishing, had been painted out, covered with bushes and shrubs to convert the painting to an elegant and simple landscape. Some research on the artist showed that his specialty was paintings of fishermen. The part of the painting that made it the most valuable as an example of this artist’s work had been obscured. Worse yet, the owner of the painting had liked it as a landscape and was disappointed by the appearance of this new interloper. I was torn–how was I to be faithful to the intent of the original artist and satisfy the owner? What a brilliant skill to have and I love the way you described having to work with the artists original brushstrokes. I always wanted to paint. Alas, while I’ve a fair hand at sculpting, I was never much of a painter. Restoring and cleaning the work of others is as close as I get to art. But you’re right–I can write. So that has to be my canvas. As for painting out the fisherman, I’d seen other ‘amendments’ to the original artists’ work, but usually in the realm of bad repairs. Finding a figure painted out of a work was a first for me. I’d consider it, but your email doesn’t work.